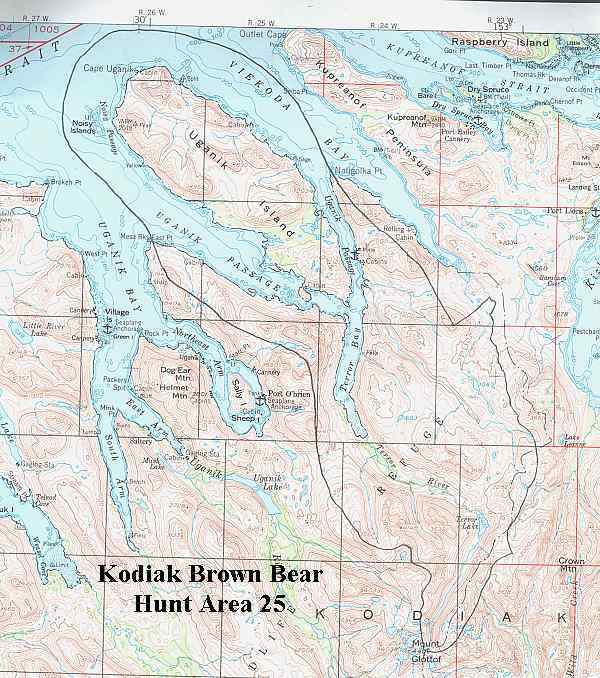 Northern Kodiak Island, including the Uganik Island, Uganik Passage, Terror River, and Terror Lake. See area map (Image file 74 kB). This area includes a wide variety of habitats. Grass/salmonberry and cottonwoods flats are common along the lower elevations and river valleys. Dense alder thickets interspersed with grass/salmonberry meadows cover steep slopes. Alpine areas start at 1500'. Inland area is composed to low ridges and foothills intersected by numerous drainages with a few small lakes. The southeast end is extremely mountainous with steep ridges with permanent snowfields. Uganik Island consists of several steep hills up to 2034'. Alders and grass/salmonberry meadows are the dominant vegetation on the island. A U.S. Fish & Wildlife cabin located on Uganik Island.